Sacramento County Blue Ribbon Commission Report on Disproportionate African American Child Deaths states African American children comprised 25% (260 of 1041) of all the perinatal conditions deaths. Deaths resulting from perinatal conditions include prematurity, low birth weight, placental abruption and congenital infections. Perinatal conditions deaths span the time period from the second trimester of pregnancy through one month after birth. Perinatal conditions are often related to maternal health during pregnancy and preconception. Public Health Division. The analysis showed that the rate for African American fetal infant deaths was 4.9 per 1000 compared with 2.6 for all races, 2.4 for Caucasian, and 2.2 for Hispanic. The higher rate of deaths for African American fetal-infant deaths was related to maternal health and result in African American infants being born premature and/or with low birth weights. Related risk factors include: stress, chronic disease, smoking, substance abuse, maternal age/health, sexually transmitted diseases, multiple pregnancies such as twins or triplets, and short pregnancy intervals with frequent pregnancies. Risk factors were known to be present in a nearly half (46%) of perinatal conditions deaths of African American children. UCLA obstetrician and gynecologist Dr. Michael Lu believes that for many women of color, racism over a life time, not just during the nine months of pregnancy, increases the risk of preterm delivery. To improve birth outcomes, Lu argues, we must address the conditions that impact women’s health not just when they become pregnant but from childhood, adolescence and into adulthood. Pregnant? Sac Healthy Baby will help you take the first step toward having a healthy pregnancy and delivering a healthy baby. First 5 Sacramento connects families with programs that give children a healthy start during that critical first 5 years. We understand that today’s parents face many challenges and tough choices as they raise their kids. That’s why we’re here to help. We offer individualized life planning that helps women plan for their futures. In addition, we also provide mother support groups during and after pregnancy that are fun and interactive with activities to help manage and reduce stress, promote healthy behaviors to support health, wellness and relationships. Nurse-Family Partnership is a FREE evidence-based, community health program that serves income eligible women pregnant with their first child. Each vulnerable new mom is partnered with a registered nurse early in her pregnancy and receives ongoing home visits. It is a life-transforming partnership, for the mom and her child. Nurse-Family Partnership helps families– and the communities they live in—become stronger while saving money for state, local and federal governments. Lives within Sacramento County service area. 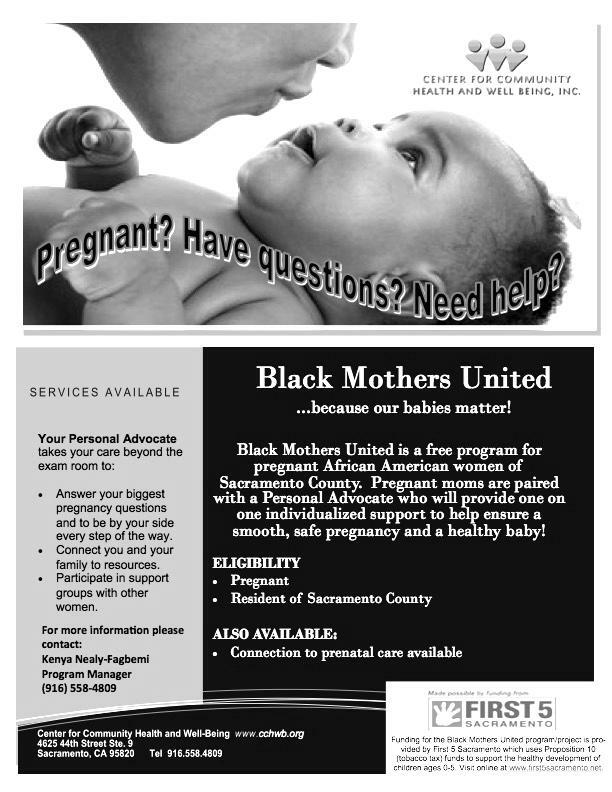 Black Mothers United aids expectant African-American women residing in Sacramento County. Eligible women are paired with a Personal Advocate who provides them with individualized support and guidance throughout their pregnancy, and up to four months after the baby is born. WellSpace Health’s Cultural Broker Program is a pregnancy support program for African American pregnant women who are at high risk for maternal complications and poor pregnancy and birth outcomes. Special 24 week cervical scan & Dental screening at 20 weeks to assess risk for preterm labor. Text4baby is a free, easy way to get important information. When you text BABY to 511411, you receive free text messages three times per week, timed to a due date or a baby’s birth date, through pregnancy and up until the baby’s first birthday. Text4baby sends personalized messages directly to you, and the texts have information you can trust because they are developed by experts from all over the country. There is also an app that provides additional information about baby’s development, pregnancy, childcare tips, and more.